The Motherwell community is still coming to terms with the tragic loss of Phil O'Donnell. Phil was 35 years old and is survived by his wife Eileen and four children. He made his debut for Motherwell against St Mirren in a 2-2 draw in November 1990.By the time we won the cup in May 1991 he was first team regular and contributed on that glorious day by scoring a sensational diving header.We won 4-3 and Phil collected his first winner's medal. A difficult couple of seasons followed for Motherwell as the club struggled to live up to expectations following the cup win but Phil won the Young Player of the Year award in the 91/92 season.By 93/94 we were back on form and a wonderful season saw us finish third in the league and qualify for Europe.O'Donnell picked up another Young Player award and his talent was attracting suitors with more resources than us.He was by now a fully fledged international having made his Scotland debut against Switzerland.Injury prevented him adding more caps to his collection. Celtic made their move for O'Donnell in autumn 1994 and he made a scoring start to his Celtic career.Unfortunately for Phil, Celtic were in the middle of their slump as they struggled to compete with Rangers.They did manage to win the cup in 1995 with Phil coming off the bench to collect his second winner's medal.Injuries were beginning to limit his involvement in the side but he did play towards the conclusion of the 97/98 season and added a title to his role of honour. Contract problems led to his departure from CelticPark and along with Simon Donnelly he joined Sheffield Wednesday.By this point his body was beginning to give out and he only managed 45 minutes of Premiership football for the Owls.Wednesday slumped through the football world but O'Donnell was left to watch from the sidelines as injury after injury kept him out of the team. By 2003 his career seemed to be coming to an end as few clubs seemed willing to take a chance on him following his release from Hillsborough.He arrived back at Motherwell to make use of our training facilities and his determination to prove himself prompted Terry Butcher to offer him a contract.He made his second debut for Motherwell, to a thunderous welcome, in a 3-1 win over Dundee United.He joined his nephew David Clarkson in the team which instantly gave him the nickname Uncle Phil. Phil played a huge role in getting us to the League Cup final of 2005, scoring twice on that marvellous run.We came up short in the final against Rangers but O'Donnell had graced HampdenPark one last time. 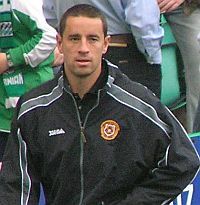 Injury ruled him out for almost all of the 06/07 season but he signed a new contract which also included coaching responsibilities.While some may have thought O'Donnell would be happy to be a squad player, he quickly established himself as a vital cog in the energetic 4-3-3 system used by Mark McGhee. One minor injury kept him out for a few games but he was looking fit and strong as he continued to exert his influence both on and off the pitch.His last goal came at RugbyPark November 2007 and helped us collect three points, while his last performance was a superb display which his manager later described as his best of the season. Phil O'Donnell was nearing the end of his football career but it must be remembered he still had another 40 years of life in front of him.He could have continued coaching, become a manager or further developed occasional media appearances. Most importantly he would have continued to be the great husband and father it is universally agreed he was.The strong emotions involved in football mean that all too often fans, players and press take part in self indulgent hyperbole before and after games.At the end of the day football is not a matter of life and death and will always remain just a game. When we celebrate or console ourselves over the inevitable highs and lows that will come in the following years it is worth keeping them in perspective.The players will eventually start again and it will be an emotional time for everyone concerned with the club.We are not in the 'Motherwell against the world scenario' of the administration years but it is time for everyone to pull together.Results may dip but Motherwell will go on - and the memory of Phil O'Donnell will go on with all of us.